The holidays are upon us and Henley Honda is getting into the spirit of the season with our annual commitment to the community! This year, we are proud to announce that we are partnering with CP24 and Honda Canada in the CP24 CHUM Christmas Wish program as a drop-off point for toy donations over the holidays. What is the CP24 CHUM Christmas Wish Program? The CP24 CHUM Christmas Wish program is one of the largest distributors of toys to children in need in the community. With a focus on creating a magical holiday experience for hundreds of thousands of children, the program also provides financial assistance to hundreds of community agencies. Last year, through generous donations from community members and corporations, the CP24 CHUM Christmas Wish program assisted approximately 300,000 people in need with toys and financial support. We are thrilled to be a part of the efforts this year — let’s blow last year’s record out of the water! 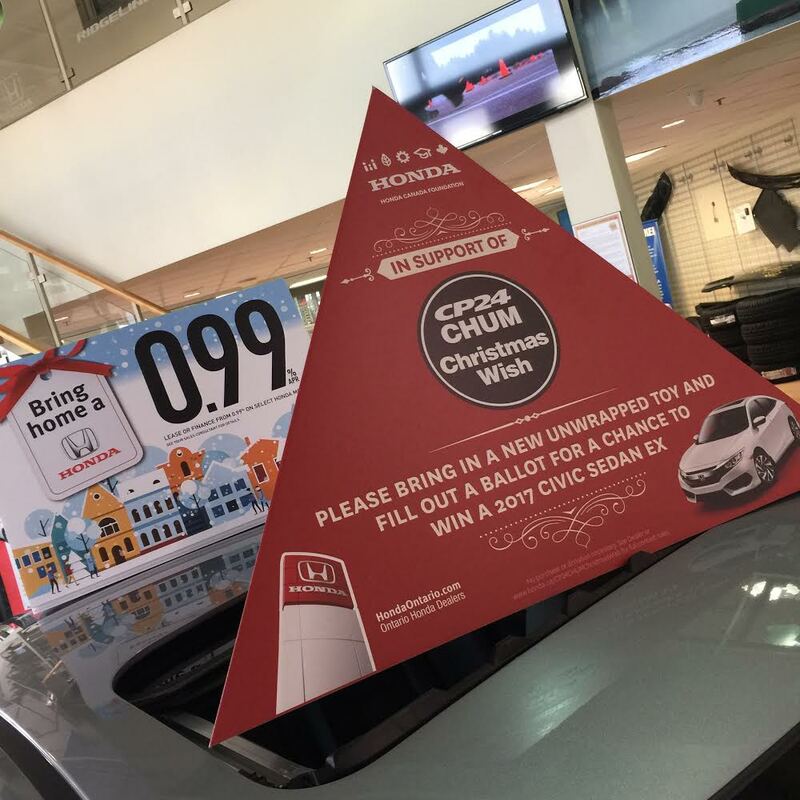 As we mentioned above, Henley Honda is drop-off location, accepting all donations big and small for the CP24 CHUM Christmas Wish program. Even the smallest donation makes a difference! All financial donations of $20 or more are eligible for an income tax receipt, and must include the name and mailing address of the person who is to receive the receipt. We are also accepting new, unwrapped toys and gifts to give a child a memorable holiday. As a thank you for your kindness and generosity, each donation with receive a ballot to win a 2017 Honda Civic EX! Thank you in advance for helping us give back this holiday season!